Oh little blog, I miss you so much, but I am almost never home any more to update (never home in the best possible way, because it means that I am out and about doing fun things). I wanted to share my most recent finished object. 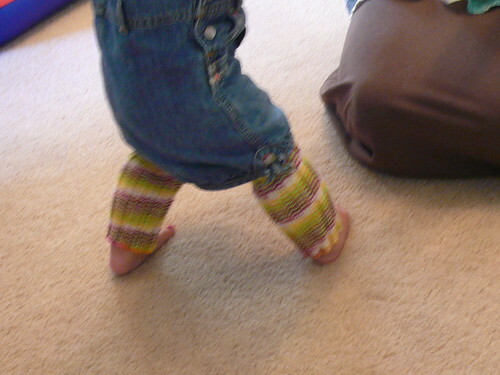 I knit these legwarmers for my friend’s baby to keep her knees protected as she crawled around. Of course, by the time I got around to knitting them, she was pretty much walking. They were simple to knit. I cast on 60 stitches and did a K3P3 rib for nine inches before casting off. The yarn is Perchance to Knit (sport?) weight yarn in the spring bouquet color. We got a chance to test them out in a little trip to a Half Moon Bay pumpkin patch. 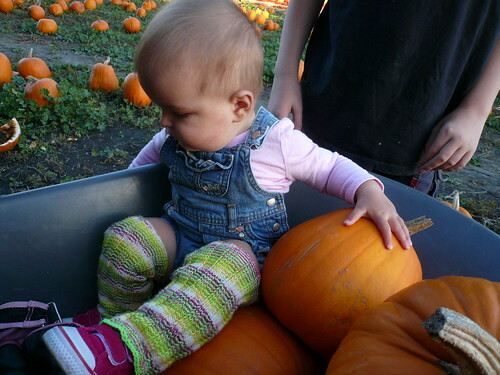 Aren’t they (the legwarmers, the baby, and the pumpkins) cute? I’m off for a weekend in Monterey. That is really cute, I love the little leg warmers. Great leg warmers and cute pictures! I emailed you this already, but thanks for the wonderful monkey socks and all the great monkey gifts! I love them all! I’ve worn the socks already a number of times and the yarn is very soft and very cozy. Thank you! Thank you!